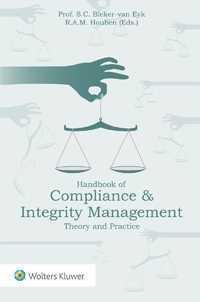 Handbook of Compliance & Integrity Management provides a scientific underpinning for the practice of compliance. The compliance discipline in companies and financial institutions has grown exponentially in recent years. In spite of a plethora of works on compliance, the academic discipline on compliance is still in its infancy. This book, which is the result of the researches conducted by the Post-Doctoral Education in Compliance and Integrity Management of the VU University, examines the subject from such crucial and varied perspectives as ethics, behavioural science, risk management, accounting, and European and international law. Much more than a critical approach to the existing practice of supervision, it provides a wealth of information, guidance, and valuable insights into the day-to-day work of compliance officers. The analysis throughout is supported by a comprehensive study of the literature concerning the raison d'être of supervision and regulation. Meeting the need for an in-depth analysis of the ever-growing area of compliance and integrity management, this book is a milestone in a field that is rapidly growing in importance across a wide spectrum of business and professional activities. It will prove to be an essential practical resource for company and institutional officers worldwide in setting up a compliance function in their organization.